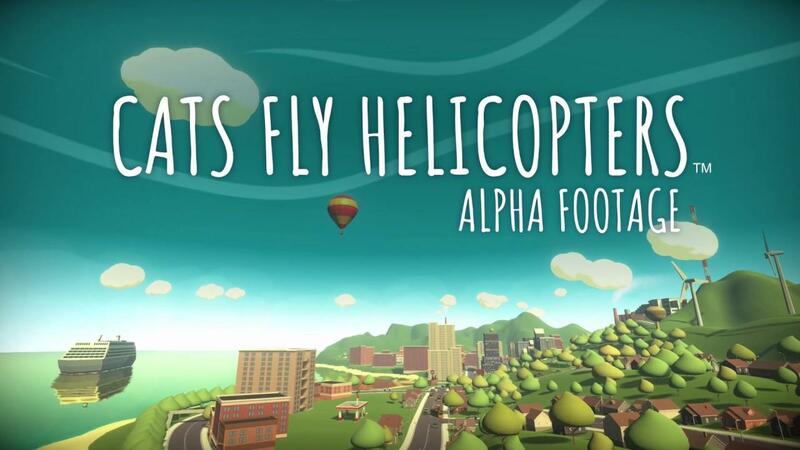 Flippfly (Race The Sun, Evergarden) have announced Cats Fly Helicopters, an amusing sounding game about being a cat flying around a simulated city full of physics and emergent gameplay. Play as an enterprising young cat from an odd family of scrap collectors. Build and upgrade helicopters to take on a wide variety jobs in an open physics playground. Personally, I think this looks like it could be a huge amount of fun. There's enough serious, bloody and hard-core games out there to satisfy my needs but not always something like this. As a parent, it looks like a game my Son would enjoy too! To be honest though, I just love the idea of flying around and picking up fire-trucks because why the hell not? Thanks for following up! I can't guarantee 100% that we'll support Linux at launch - but that's the plan right now! To be frank with you: A lot of it will depend on what our Steam wishlist activity looks like, and whether we feel like we can reasonably support it after doing beta testing on Linux. In the past Linux has made up a pretty disproportionate bit of our tech support (and a very small chunk of our revenue) - so that puts a lot of pressure on our tiny team - but we've supported it because we really appreciate how helpful and positive the Linux community has been with bug reports etc. We're also running a Patreon where $5 backers get beta access, and $10 backers get one "TinyGame" a month, and we're going to try publishing Linux builds there and see how it goes. If Linux users end up contributing there it'll definitely affect our decision-making too. So if you do want to see this on Linux, wishlisting it and follow it on Steam will help (make sure you set your platform). Even better if you contribute to their Patreon. Quote but we've supported it because we really appreciate how helpful and positive the Linux community has been with bug reports etc. Proof that attitude can help garner game support in lieu of market share! It's always interesting when this comes up, as it goes back to the "How to be a great advocate for a niche gaming platform" article Marc from Unity (ex feral dev) did. To be frank with you: A lot of it will depend on what our Steam wishlist activity looks like. It's a little like a cat-ified version of SimCopter, added to wishlist. So it's about cats . . . doing work?! Wow, quite the imagination these people have. Since it actually has Linux system requirements, I have no qualms about adding it to my wishlist this time. flesk Since it actually has Linux system requirements, I have no qualms about adding it to my wishlist this time. Some people have qualms (another word new to me) with setting OS to Linux only, which is most probably needed to make this information valuable towards a port for this developer.